After the 2004 election, a map showing President George W. Bush’s (R) reelection map by county became a notable Republican souvenir and bumper sticker. Entitled “Bush Country,” the map showed a largely red map with the election results shaded by county. Of course, Bush only beat John Kerry (D) by about 2.5 percentage points, but the map made Bush’s triumph look much bigger because Republicans do well in rural counties and Democrats do well in urban ones. Even in last year’s election, Mitt Romney won more than three of every four counties against President Obama, despite losing the popular vote by about four percentage points. The rural/urban divide in American presidential politics is pronounced, and it extends to the U.S. House. Generally speaking, Republicans win the districts that are geographically large, and Democrats win the districts that are geographically small. This squares with the national political scene — as we noted right after the election last year, Obama won more than 90% of the nation’s 50 most populous counties, while Romney won more than 90% of the counties in rural Appalachia. This helps explain the Republicans’ structural advantage in the House. Yes, redistricting in many states has something to do with it (although Democrats benefit from gerrymandering in some places too), but Democratic voters are also clustered closer together than Republican voters are, which hurts Democrats. For instance, Obama won 70% or more of the vote in 61 House districts in 2012, while Romney got 70% or more in just 19 districts. Political scientists Jowei Chen of the University of Michigan and Jonathan Rodden of Stanford University argue that the close proximity of Democratic voters dilutes their power in the House: “In many states, Democrats are inefficiently concentrated in large cities and smaller industrial agglomerations such that they can expect to win fewer than 50 percent of the seats when they win 50 percent of the votes,” they wrote. The United States is roughly 3.5 million square miles, and districts range in size from Rep. Don Young’s (R-AK) at-large district — which at about 570,000 square miles accounts for 16% of the entire nation — to Rep. Charlie Rangel’s (D, NY-13) New York City district, which at only 10.25 square miles is about half the size of the island of Manhattan (Rangel represents Harlem, northern Manhattan and a portion of the Bronx). Rep. Steve Pearce (R, NM-2) holds the largest, non-at-large district in the country. Because of the distorting effect of Young’s gigantic district and other big, at-large districts — the states of Alaska, Montana, Wyoming and South Dakota are technically the four biggest “districts” in the United States — the average size of a House district is about 8,100 square miles. That roughly corresponds to the size of Rep. Jim Clyburn’s (D, SC-6) district, which is the 87th largest district in the country. A better way to analyze these districts is to look at the median, which is Rep. Frank LoBiondo’s (R, NJ-2) district in southern New Jersey. At about 2,100 square miles, NJ-2 is both the 218th biggest and 218th smallest of the 435 House districts. In the 217 districts larger than the median, Republicans hold three-fourths of the districts; in the 217 districts smaller, Democrats hold two-thirds of the seats. For strategists, the size of a congressional district is important in at least one major way: television spending. Small, suburban districts are in many cases covered by just one media market, but ad spending can be very costly. For instance, Rep. Mike Grimm (R, NY-11) holds the smallest Republican district in the country, but the Staten Island-centered seat is covered by the pricey New York City media market. Meanwhile, Rep. Pete Gallego (D, TX-23) holds the largest Democratic district in the nation, and it crosses several media markets as it stretches from El Paso to San Antonio. Rates in those markets are much cheaper than in more populous markets like New York City, but advertising efficiently in such a big district presents its own challenges. We were surprised to find that there’s not much statistical correlation between the size of a congressional district and its general partisan leaning (as measured by Obama’s performance in the 2012 presidential election). The correlation was only about -.35, which is statistically weak. We did not include the seven states that only elect one representative — AK, DE, MT, ND, SD, VT, and WY — because the size of some of these states would skew Chart 1. 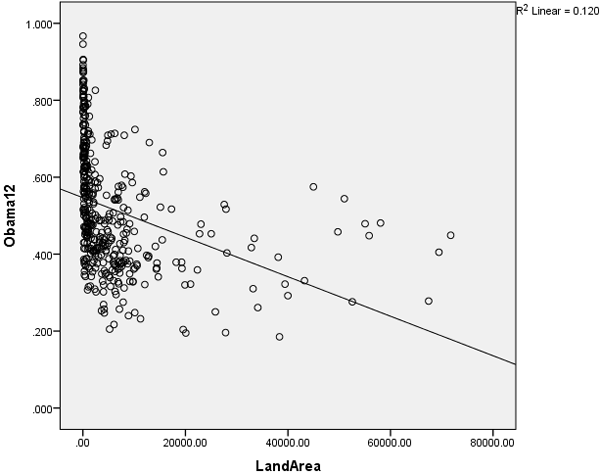 Note: Land area is in square miles. Therefore, one cannot predict from the size of a congressional district how the president would have performed there (we used presidential results, not congressional results, because many members are unopposed and because the presidential results provide a more accurate read on the district’s true partisan lean). That said, the basic observation still stands — Republicans generally win the bigger House districts, and Democrats generally win the smaller ones. 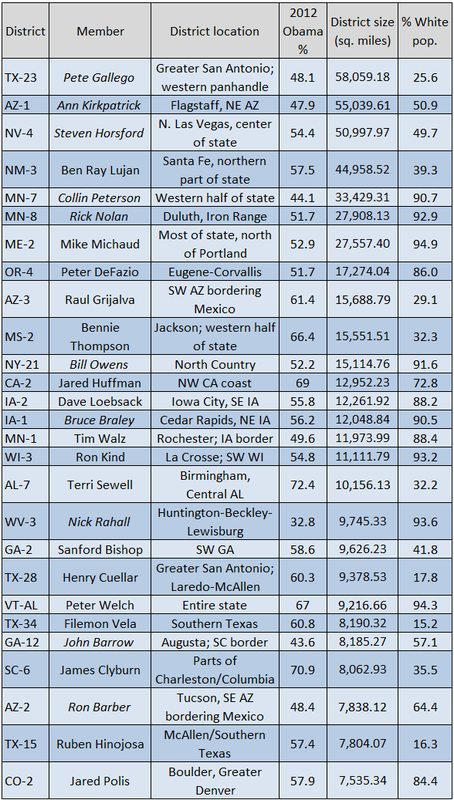 To drill down a little further, Democrats hold 87 of the nation’s 100 geographically smallest districts (and 39 of the smallest 40), and Republicans hold 73 of the 100 biggest districts (and 33 of the biggest 40). Charts 2 and 3 highlight the Democrats who occupy one of the 100 largest districts and the Republicans who hold one of the 100 smallest districts. These are the biggest outliers. Notes: Names in italics are in seats listed as competitive in current Crystal Ball ratings. Sources: Daily Kos Elections for Obama 2012 vote percentages; U.S. Census Bureau and Crystal Ball research for district sizes and demographics. Six of the 13 Republicans on the list represent white plurality districts in suburban parts of Arizona, Georgia and Texas — white voters in these states are more Republican than the nation as a whole. Also keep in mind that the census numbers are for the entire population of a district, not for those who vote or are eligible to vote. Hispanics, in particular, don’t (yet) vote at the levels their share of the population would suggest, which presents well-documented trouble for Democrats in places like Arizona and Texas. Generally speaking, Democrats should be able to target smaller, suburban districts, but the Texas suburbs represented by the four Republicans on this list are deeply Republican — and, in reality, the urban areas they surround are pretty conservative, too. For instance, Obama won the nation’s third-most populous county, Harris (which contains Houston), by less than one-tenth of a percentage point in 2012. Florida Republican Reps. Ileana Ros-Lehtinen and Bill Young are two long-serving members of Congress who have seen their respective Miami and Tampa Bay-based districts become more Democratic over time, but turnovers to the Democrats will probably have to wait for them to retire. In New York, veteran Rep. Peter King (Long Island) and relative newcomer Rep. Mike Grimm (Staten Island) are the only Republicans who represent parts of the New York City area, but their constituents are historically more Republican than the areas closer to the city. Finally, out in California, there are a couple exceptions worth noting. Rep. Gary Miller is an accident: As noted here many times, his fluky victory depended on his Democratic opponent failing to advance to a general election runoff thanks to the Golden State’s new election rules last year. And Rep. Ed Royce feels like something of an outlier given that he holds a majority-minority district, though it is anchored in Orange County, the dwindling bastion of Southern California Republicanism. (As as a sign of its partisan history, it contains Yorba Linda, home of Richard Nixon’s birthplace and presidential library.) Still, this district could be a target for Democrats at some point given its sizable Hispanic and Asian-American population, perhaps when the 61-year-old Royce retires. 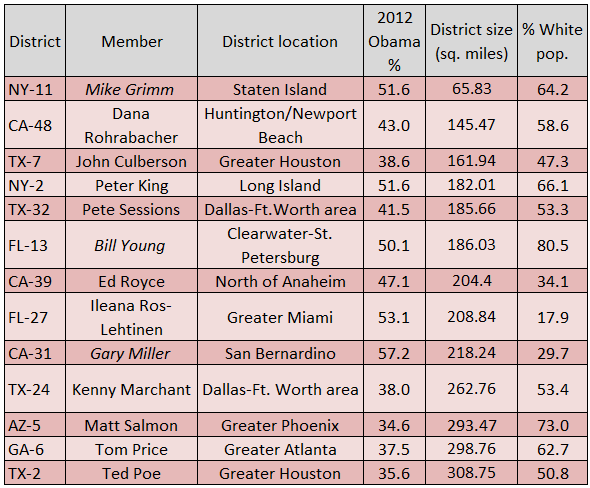 The Democrats who hold one of the 100 biggest districts make up a longer list than the small-district Republicans. Some of them are easily explained: 11 of the 27 districts are majority-minority. It’s common to think of majority-minority districts as being exclusively urban and small, but that’s not always the case. For instance, there are a few large, majority-Hispanic districts located in Southern Texas, and the single biggest districts in Mississippi and South Carolina are each majority black. If the conservatism of whites in places like Texas explain why Republicans have a hammerlock on some small, suburban districts, the relative liberalism of whites in places like Iowa, Minnesota and Wisconsin help explain why Democrats hold some geographically large, heavily white districts in those places. Obama actually won whites in very white Iowa — recall that Obama lost roughly three-in-five white voters nationally in 2012, according to the national exit poll — and he only lost whites narrowly in Minnesota and Wisconsin. Some familiar names to House-watchers are on this list, too. For instance, Reps. John Barrow (GA-12) and Nick Rahall (WV-3) are going to be Republican House targets in 2014 after winning decent-sized victories in 2012, and their seats almost assuredly will go Republican after they retire, if not sooner. Generally speaking, the longer Democratic list of members in big districts more closely corresponds to the Crystal Ball’s list of competitive House seats — 10 of the 27 we judge to be competitive — than the shorter list of competitive Republican seats in small districts (three of 13). The full data on all 435 districts are too bulky to reproduce here, but we’ve posted a full chart of the districts ordered from largest to smallest for readers’ perusal. Looking at the House through the geographic size of the districts is a different way to analyze Congress, yet it is very similar to that old “Bush Country” map from 2004: Less Republican than meets the eye, but Republican, still. — Geoffrey Skelley contributed to this article. Thanks to pithy Twitter follower @BobbyBigWheel for suggesting the idea for this article.